Convivial spot celebrates Ireland's pub culture. 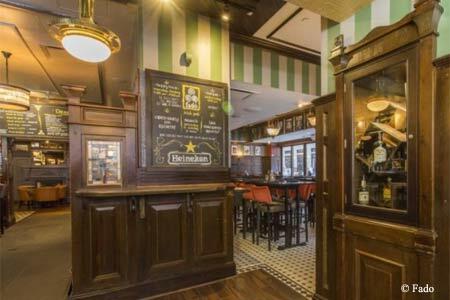 : At this authentic Irish pub, there's always a soccer --- "football" --- match on the telly, and the fish ‘n’ chips just need a bit of vinegar to conjure up the spirit of Dublin. Straight out of a James Joyce novel, the chummy Center City spot is adorned with antique wooden carvings, a fireplace and even snugs, which are private nooks ideal for snuggling. Customers can enjoy a pint of Guinness on draft alongside a menu that puts a contemporary spin on new Irish cuisine. Be sure to try a classic boxty (filled potato pancake) that Fado incorporates into dishes like chicken quesadillas, smoked salmon and hummus. For dessert, the Guinness ice cream is a must.